If there is one hobby I wouldn't mind picking up, it's buying records. I love the sound quality (especially of older, original albums), the huge disc shape and the seemingly undying surge of record collectors. If anything, it's purely the abundance of other stuff in my life that keeps records at bay. Yet despite my lack of record keeping, I still love record shops and I love it when the concept of a record store fuses with that of a quality coffeehouses to create a megazord like Porchlight Coffee and Records. Residing on 14th between Pine and Pike, the coffeehouse has a pleasant muted exterior that funnels into a simple cafe, with white walls, large open windows and two namesake porch lights dangling from the ceiling near a rare Seattle skylight that does a good job of pulling in the limited rays. As for coffee, they sling local Herkimer Coffee. As I perused the records that fine morning, I grabbed an espresso of their Espresso Blend and a drip of their Drip Blend. The espresso, pulled short with a brown crema, smacked of a delicious blend of lemon, roast chicken, rosemary, cocoa, salty caramel and a little seltzer amidst a deep body. The drip proved a little too smoky for my liking (had a minor flavor of tobacco on the back end), but it still made for a tasty cup with notes of wheat, cashew, sage, spinach and some olive oil. 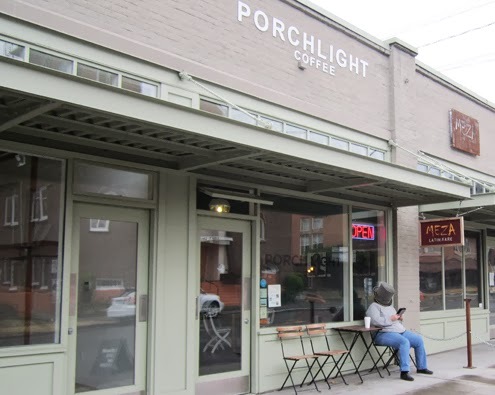 Except for the drip (which was still good and could have very well been a fluke that day), Porchlight made for a convenient quality coffee stop, whether you seek records or not. Make your way over when you're in town. A new hot spot in my collection, thanks you for the review..